Why yes, we do sell BTMS-50! I have to give the Xantham Gum/Beeswax group in both classes huge props (yes, that gloppy mess is Xantham Gum in the photo above). 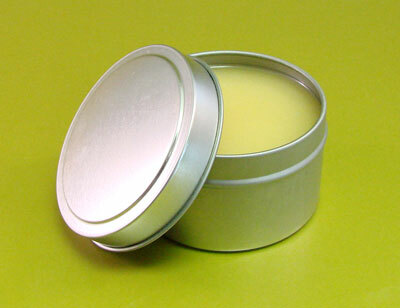 It is a common urban myth that Xantham Gum/Beeswax emulsifies into something resembling lotion. That is a lie. It looks more like snot and acts similarly. It even dries in sheets on your skin. You can peel it off. It is that strange and weird. The Xantham Gum/Beeswax groups in both classes really gave it their all working with this strange emulsifying system. They both heated up their stick blenders so much that we were worried that they were going to burn out! 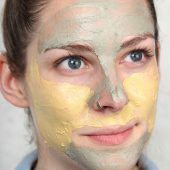 Overall, while I did not take a vote, judging from the lotion learners coming up to me after the class, the BTMS-50 emulsifier blend is the clear and definite winner of the 5 lotions. 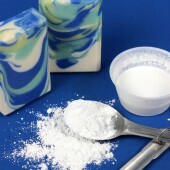 You can mix BTMS-50 with Emulsifying Wax NF in regular lotions or just use it alone as the emulsifying agent. Why BTMS-50 over straight Emulsifying Wax? 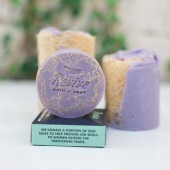 Because BTMS-50 has a conditioning agent added to it that gives it just that extra silky, powdery feel on the skin. It’s just as easy to work with as Emulfisying Wax NF and it has just that extra touch of smoothness that makes it feel expensive, classic and sophisticated. By the way, BTMS-50 can be used in hair conditioners as well. 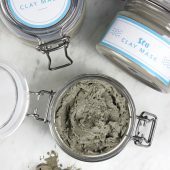 It’s an easy, cost effective conditioner base. The recipe is here. 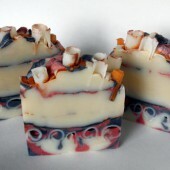 Both classes were super troopers with the hands-on portion and it was one of the most fun classes I’ve ever taught, thanks to the awesome helpers the Soap Guild sent to be hands-on, and the exhuberant spirit of the attendees. I created this recipe for our October Newsletter (not on the Newsletter? 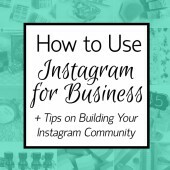 Sign up here for specials and cool “insider” opportunities) and it was such a hit I wanted to share it with everyone on the blog. 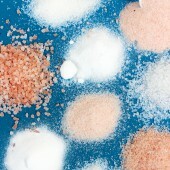 Measure out all of your ingredients by weight before you begin. The safest way to melt down the ingredients is in a double boiler – but you can use a microwave as well. Just watch your mixture very carefully (remember the exploding microwave?). And I always pull my container out of the microwave and stir to melt down the last few bits which helps to avoid overheating your ingredients. Melt the wax until liquid then add the Cocoa butter. 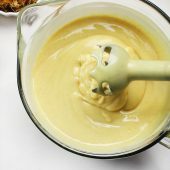 Once the Cocoa butter is completely melted add the Tapioca Powder and mix until there aren’t any lumps (hint: a little whisk helps with this). 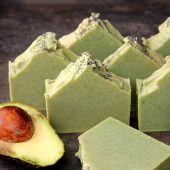 Finally add the Pistachio butter, remaining oils and fragrance to your preference. Mix well and pour into a 6 ounce tin. 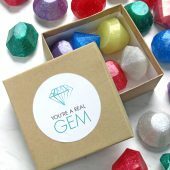 If you’re not signed up to our newsletter, you should – it has cool how-to’s as well as aggressive sales for newsletter subscribers only. Sign up here. Here is another project pioneered by Bakima, the intern-turned-paid-employee. We’re lucky she still has time to play with fun projects. 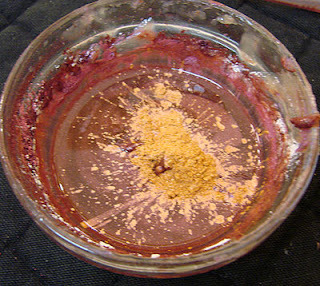 One – Melt down the candle wax in 30 second installments, taking out the heat safe (Pyrex) container and stirring the wax between microwave bursts. 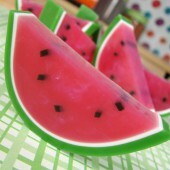 You can also melt the wax down in a double boiler. 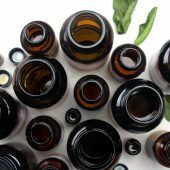 Two – Add 1 oz of essential oil per pound of wax (1 oz if you’re sticking to the same recipe as above or multiply as needed). 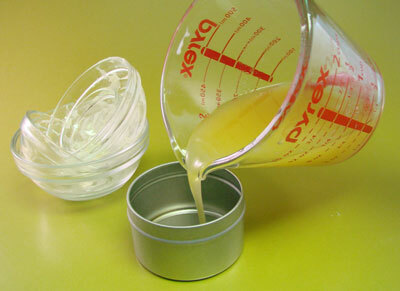 Three – Pour in your melted wax, leaving about a third of the wax left over in the heat safe container. 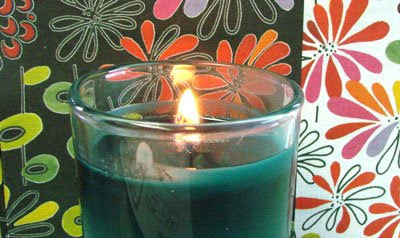 Five – Let dry, trim your wick to about 3/4 of an inch and enjoy your summer evenings, skeeter free. 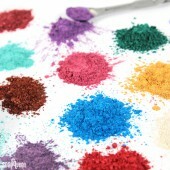 When making lipstick, there are a lot of different ingredients you can use. 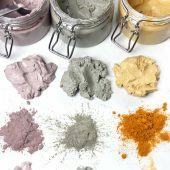 The basic ingredients are covered here but there are many, many more exotic oils, waxes and butters that can be used in lipsticks. 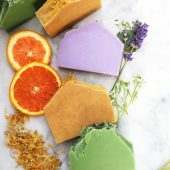 Wax – Waxes can be beeswax, candelilla wax, jasmine wax, orange wax and ozokerite wax. 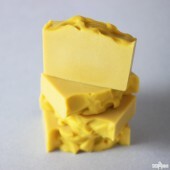 Most common to the home crafter is beeswax because of its pricing and easy availability. 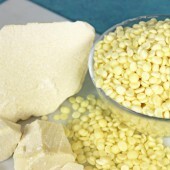 For vegans, candelilla wax is the preferred alternative since it is derived from a plant. 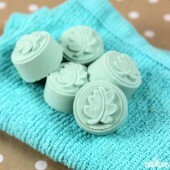 Waxes are used to help provide a barrier against the elements, seal moisture in the lips and keep color on your lips. 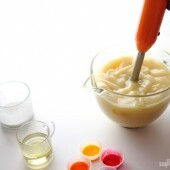 Waxes also help to provide shape and form to the lipstick mixture. 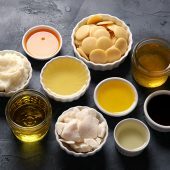 Oils – Oil in lipstick are used to be moisturizing, help provide a barrier against weather and also mix with the waxes to form a smooth, spreadable mixture. 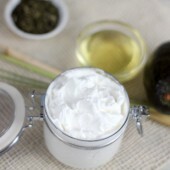 Popular oils in lipsticks are Sweet Almond Oil, Avocado Oil, Olive Oil and Hempseed oil. 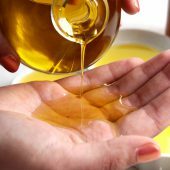 There are many other liquid oil options to use. 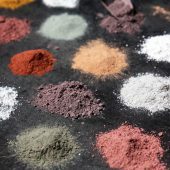 It’s fun to play around with exotic or lesser known oils but remember, if your lipstick really takes off in the market, you want to make sure that the oils you choose are easily available and cost effective. 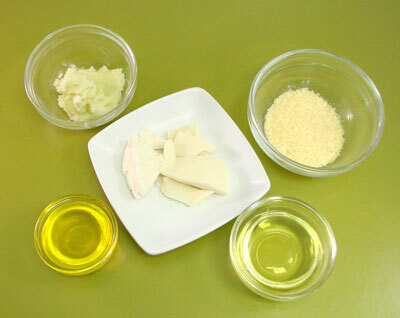 Butters – Butters are used in much the same way as oils are. 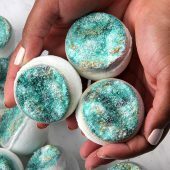 They are designed to moisturize, help protect and make a stable mixture that is solid at room temperature yet glides and melts on the lips. 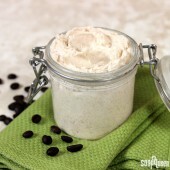 Common butters in lip balm recipes are Shea Butter, Mango Butter and Cocoa Butter. 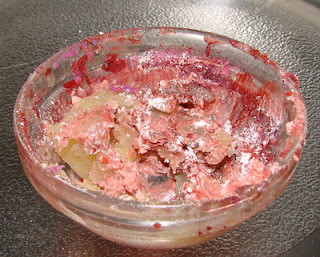 Generally, large brands of lipstick do not use butters in their formulations. 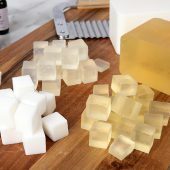 Since butters are comprised of many different fatty acid chains, they are described as “polymorphic,” which means that they have the ability to crystallize in several different forms according to how the liquid fat is solidified. What this means to you is that butters must be treated with gentle loving care in lipsticks. You need to melt them slowly (temper them) and then immediately place the finished product into the freezer for quick chilling. 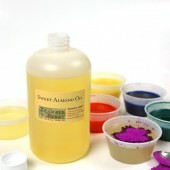 This will help to minimize any crystals that might form hard, unsightly bumps in your final product. Or, you can do what the “big guys” do and just avoid butters all together. 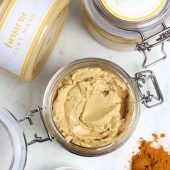 Lip Safe Fragrance – Lip Safe Fragrances are commonly referred to as “flavors.” They are not the traditional alcohol based flavors or extracts in the grocery store. While fragrance oils have up to 3500 different ingredients that can go into them, less than 10% of them are classified as safe for lips. This is because you “eat” your lipstick so anything that goes onto your lips must be GRAS (“generally recognized as safe” as classified by the FDA). 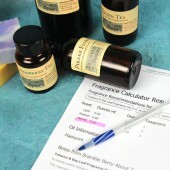 Flavor oils, or lip safe fragrances, do not taste like anything. Rather, the user is tricked into believing that the lipstick or lip balm “tastes” because they inhale the scent. 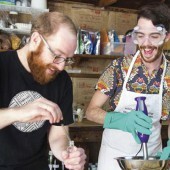 Seventy-Five percent of what we taste is actually from our sense of smell. Before you get started, gather your equipment and ingredients. 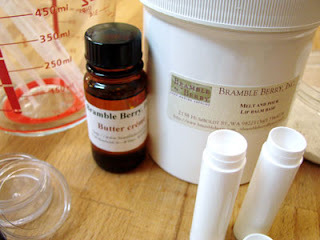 Recently, one of our Bramble Berry customers wrote with some problems he was having unmolding his 8% beeswax soap. It was sticking in his lovely Milky Way Tray mold and causing him no end of consternation. We made his recipe for him to test it and see if it was technique or the mold. 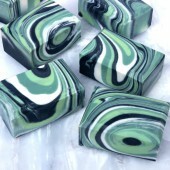 It was exciting to see that a thicker trace was all that was necessary to make a great batch of soap that released easily from the mold. 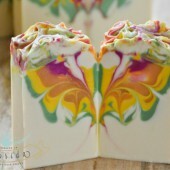 Isn’t that batch of soap nicely colored? 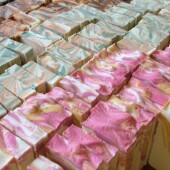 It’s all natural coloring from the yellow beeswax. 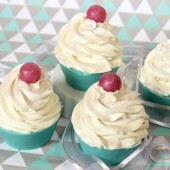 We scented ours with a little Lemongrass. 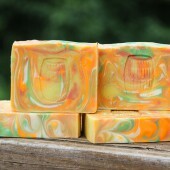 The undernote of Beeswax and the Lemongrass make for a match made in heaven! As promised two weeks ago, here are two short videos of the long (thirty minutes plus!) scraping process to get the beeswax spill off our kitchen table. The hand in the video belongs to my father. After testing the chocolate balms all week and overdosing on chocolate this weekend, there is a clear winner. The Brambleberrians in the office (Nicole, Amber, Jen and Anne) agree with my choice of chocolate winner. 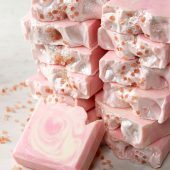 I was surprised when we all chose the Bittersweet Baking Chocolate as the best texture and taste. 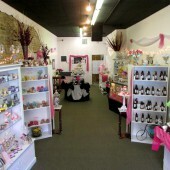 The Bittersweet Baking Chocolate beat out all the other expensive, organic, fair-trade chocolates. 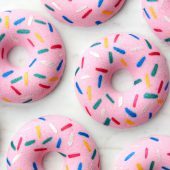 Of course, there’s not much marketing cachet with regular Bittersweet Baking Chocolate so keep that in mind when formulating your product for sale.Our favorite recipe is easy and simple. 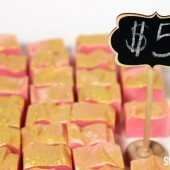 Here is an easy variation to make your ingredient label more exotic and your marketing pop! Marketing Points: Contains Organic, Fair-Trade Certified Chocolate! Vitamin E oil promotes supple lips! 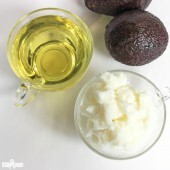 Avocado Oil is high in essential fatty acids for moisture! Jojoba oil closely mimics the skin’s natural lipid profile! 3.0 x .42 = 1.26 oz. 3.0 x .29 = .87 oz. If you want to make a larger recipe, just substitute the “3” for whatever total weight you want your recipe to be and multiply out the math. Questions? Comments? Just post and I’ll get back to you in a timely manner. Now, go forth and choc-i-fy! Bittersweet Baking Chocolate comes in handy 1 ounce squares. You can use just a bit without ruining the entire bar of chocolate. 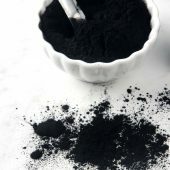 Commercially purchased chocolate, such as the Green & Black and Vivian line, end up going bad if exposed to the open air too long. Be prepared to sacrifice for your Choco Balm by eating any remaining chocolate when using anything but Baking Chocolate. Traumatizing, I know. We suffer for our craft. Making Choco Balm can be messy. Too much of the suffering (um, eating) of leftover chocolate causes sugar shakes. After one too many shaky mishaps, I tried a dropper. The opening was too small. The chocolate kept congealing in the teensy spout. More shaking and spilling ensued. Hint: Take a 3 ml plastic dropper, cut it off at the widest point and use this to draw up your melted, thick chocolate mixture. The opening is wide enough to take even the thickest chocolate balm. Rinse the dropper hose out with super hot water in between batches. It’s advisable to have plenty of paper towels on hand. 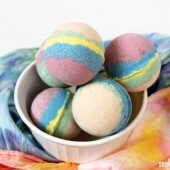 Oil and chocolate is difficult to get out of cloth washcloths. 1 part Green & Black Organic ChocolateCheck back later for pictures of the Big Spill and hints on cleaning up melted chocolate, wax and oil from white grout. After the Double Boiler did not melt Hershey’s Chocolate successfully, I got impatient. I put 1 Tablespoon of Hersheys, 1 Tablespoon of Jojoba Oil and 1 Tablespoon of Beeswax (pre-melted) into a microwave safe bowl. I shoved the bowl into the microwave for 60 seconds. My haste was not rewarded. The stinking lumpy mass of goo that ensued was disappointing. My house smelled of burnt chocolate. I was stymied but regrouped and tried again with shorter microwave bursts. It was with much excitement that I tried the melt process a second time. I stared intently at the chocolate goo whirring around in the microwave, stopping the process to stir every 10 seconds. After 1 minute and 20 seconds, the batch with the Hershey’s had melted but was not incorporating. I stirred with more vigor. It held together better. I triumphantly pulled out my frozen knife from the freezer. I plunged the cooled implement into the piping hot mixture. 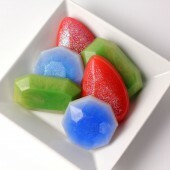 The chocolate, waxes and oils instantly solidified on the frozen knife. The insta-cooled balm was easy to spread on my lips, tasted delicious and the proximity to sugar made me euphoric. I carefully poured the balm into the clear twist up tubes. There was some cackling with glee and delight as the chocolate started to cool. The cackling turned to dismay as the Hershey’s concoction started layering, with the heavier waxes dropping out and the milk solids rising to the surface. Check back tomorrow for more recipe trials, spills and outright disasters. After all the supplies were assembled, I made a make-shift double boiler for the beeswax and the chocolate. In the past, I have exploded one Pyrex container and a microwave glass trying to melt beeswax in the microwave. I decided to play it safe and make a double boiler with an old mug.Chocolate contains a large amount of cocoa butter. 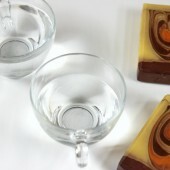 Traditionally chocolate needs tempering in order to make sure it does not crystallize. When chocolate crystallizes, it looks white and cracked. 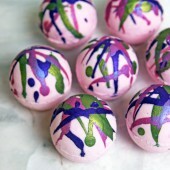 It’s fine to eat but not the look that we are going for with our Choco-Balms. I made a tempering bowl for the chocolate. The chocolate tempering bowl was a disappointment. The chocolate just sat and sat and sat. It got slightly mushy but never fully melted. In hindsight, I think this is because Hershey’s Chocolate doesn’t contain much chocolate. In fact, “chocolate” is fourth on the ingredient list. It comes after sugar, milk, and cocoa butter. For comparison, the two foodie chocolate brands I used had organic cacao, organic cane sugar and and organic cacao butter for their first 3 ingredients. Neither Green & Black or Vivians have milk solids in their ingredients listing. As it turns out, Hershey’s Milk Chocolate is not a friendly product to craft with because of the milk. After attempting to melt the chocolate for over 30 minutes on the stove, I gave up. 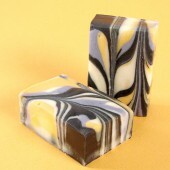 Here is a chunk of chocolate, with jojoba oil and beeswax. It is sitting in a heat safe bowl, all ready to be put into the microwave.Check back tomorrow for Hershey’s Lip Butter Disaster and the method I picked to melt all the ensuing 9 batches. 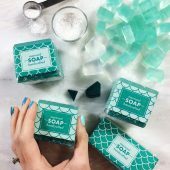 Often, new soapmakers will be dissatisfied with their melt and pour base – believing it to be too soft or not as long lasting as commercial (detergent based) bars of soap. Adding additional waxes makes intuitive sense. After all, waxes are hard! 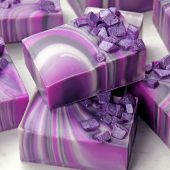 You would think that extra waxes in your melt and pour soap would make your soap extra hard. This is not the case. 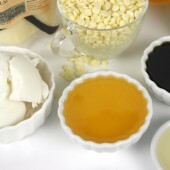 In the photo above, you can see that the beeswax does not want to mix in easily. In fact, the wax is pooling at the tops of my little experimental bars. Once the bar is popped out, it’s a matted, dull color. It is not shiny and appears to be pitted. 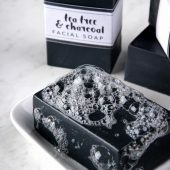 When you touch a bar of soap, it should be hard. Being able to squish it between your thumb and the table is bad. I made this mess with a gentle press of my finger. Ick! 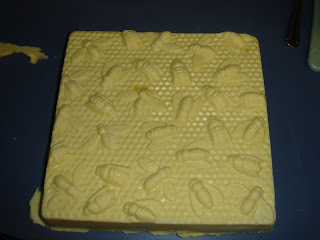 The beeswax not only softened my soap but it also made it dull looking with pock marks. 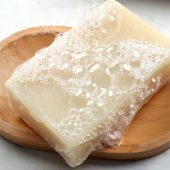 To add insult to injury, the soap lathers badly – perhaps because beeswax is not a natural lathering agent. The moral of this story? 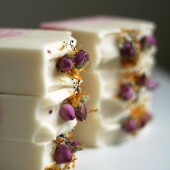 Beeswax is not an effective hardening agent in soap. 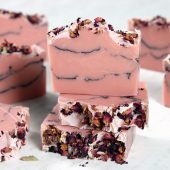 A better solution is to pop your soap out of the molds and leave them under a fan for a few days to help wick off excess moisture and speed the drying-out process of the soap. 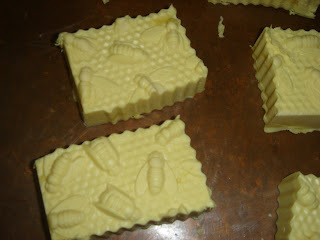 This will produce a much harder bar than adding beeswax. I thought this was a funny little blurb. 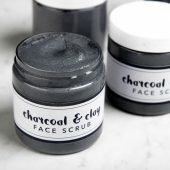 Some of my favorite lip balms on the ‘net right now are: Salty Girls, Juice Beauty (in “Playful” tint)and Biggs & Featherbelle. 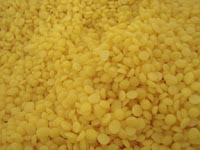 Bramble Berry has an awesome deal on Yellow Beeswax, candle grade. It’s just $3 per pound in the 55 pound bag. That’s a very aggressive price. 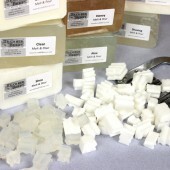 You can use beeswax for candles, fragrance tarts, fragranced wax ornaments, or wax dipped bears. 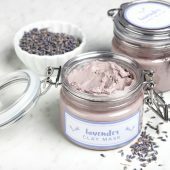 At $3 per pound, your fragrancedwax ornaments would cost about $.50 to make and your nicely sized 4 oz candle, only about $1 with fragrance, color and wick. Cute handmade lip balm with hand scribbled decorations for a rainy-afternoon project or perfect for a sleep over party for your 13-year-old.